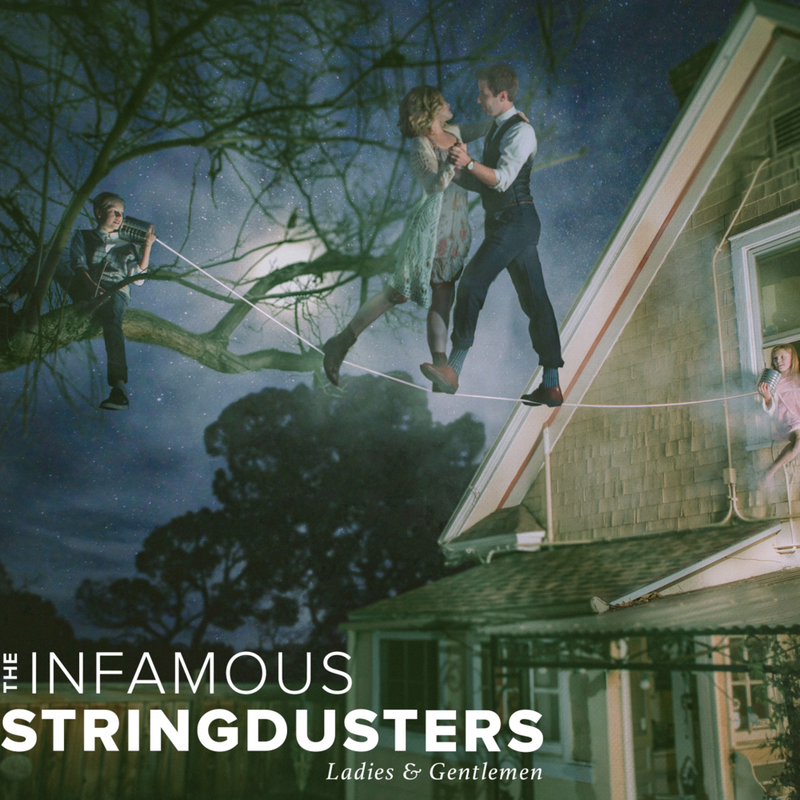 With their new record Ladies & Gentlemen, the Infamous Stringdusters are stretching the boundaries of their sound once again. The album features a dozen of the most celebrated women in roots music, vocally shining with the Dusters’ robust flavor of modern bluegrass to make for a compositional masterpiece. One of the more critically acclaimed string bands of their generation, the instrumental talents of Andy Hall (dobro), Andy Falco (Guitar), Travis Book (bass), Chris Pandolfi (banjo), and Jeremy Garrett (Fiddle) are on full display in Ladies & Gentlemen. This album is about more than just artistic collaboration, though, digging deeper into socially-conscious subject matter than the Grammy-nominated group has done in the past. The record begins with Joan Osborne leading a triumphant call for independent thought on “Listen”, assisted by a powerful drum section and just the right amount of country twang. Laid down on Garrett’s thoughtful fiddle notes, the passionate voice of Sarah Jarosz stresses the importance of cherishing the short time we have together on “It Won’t Be Long”. “Have a Little Faith” is an uplifting plea for people to trust that life will work itself out, and to cherish what’s in front of you at all times. Joss Stone’s sensual voice delivers the message with an authentic spirit that fans of the Dusters have come to expect. The chilling voice of Sara Watkins asks the listener to take a moment of self-appreciation in “See How Far You’ve Come”, accompanied by a celebratory composition that highlights each band member in turn. Hall’s dobro incites the charge into the wild west, and Celia Woodsmith lends her brassy vocals to the assertive “Old Whiskey Bottle”. Set to join the Dusters for most of their spring tour, Nicki Bluhm floats into a bittersweet remembrance of lost-but-not-forgotten romance in “Still The One”. In a very well executed change of narrative, “Coming Back to You” is a testament to the resiliency of love, with Mary Chapin Carpenter feeding off the invigorated fiddle playing of Garret. “Ladders In The Sky” builds off of Pandolfi’s constantly evolving banjo rhythm, running parallel to the theme of persistence sung by Claire Lynch. From the opening notes of “Run to Heaven” it is immediately apparent that the song is going big places. Aoife O’Donovan conveys a shocking amount of attitude on an unapologetic journey into the great unknown. “Rock and Roll” features the angelic voice of Abigail Washburn alongside a trumpet for a refreshing swing that really helps the track stand out from the rest of the record. The bustling instrumentation that has become the backbone of the Infamous Stringdusters is back on “Hazosphere” supported on trumpet by Jenn Hartswick. Technically a bonus track on the album, this seems to the band’s reminder to fans that even though they focused more on lyrical songwriting and composition during Ladies & Gentlemen, their improvisational spirit is here to stay. Ladies & Gentlemen can be purchased on The Infamous Stringdusters’ website. The group just embarked on a national “Ladies & Gentlemen Tour” canvassing the western half of the country until mid-March, when they come back East to show the right coast some love through April. At different points throughout the tour they will be joined by special guests Nicki Bluhm and The Gramblers, Della Mae, Lindsay Lou & The Flatbellies, and Paper Bird. Great article- can’t wait to catch them in Raleigh, April 3rd!